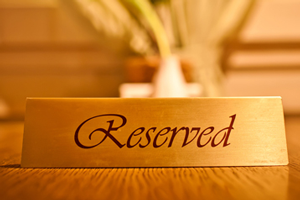 Reservations are something that lends an elite air to any eating establishment. While you may think that you simply have to set up a system for this it isn’t just about creating such a setup. You also need to have the outdoor furniture and other beautiful items to make people feel like they need a reservation. Otherwise they will just see you as stuck-up and simply go somewhere else to enjoy themselves. Restaurant bars and other locations have used this to greatly improve their clientele over time and you can too. So what are the benefits of creating this sort of atmosphere? The first one is that you can attract a higher quality of customer, or at least one that has many more financial resources available than the average person. In either case it should be easy to understand why this would happen in both of these cases. You may want to gamble on the additional class it affords to any sort of establishment. As far as frills to draw people in there is no limit. Fire Pit Tables and special serving dishes are all items which you can add to your outdoor furniture setting in order to get more reservations. People will pay more for the privilege of novelty items as well, as long as they have a classy sheen to them. Once again it comes down to what people think of your items in a normal atmosphere. Before going with this sort of setup you need to make sure that you can provide the level of quality needed all the time. Your food and service has to be top-notch, or at least people have to think that it is when they are there. Publicity from the media can help with this and so can word of mouth so you need to work on both of these aspects in addition to changing any décor which you may have used previously. If you already have a rich atmosphere all you need to do is work towards changing things in the direction of an elite setting. There is a difference between expensive and elite and that once again comes down to how people think of you. Good reviews for all of your places of business do not hurt either. Outdoor furniture should be picked out and maintained to the highest quality while you monitor social media and other outlets for negative reviews which could leave people confused about just what you are offering them. For those who feel left out due to this, that is tough. You do not want those people anyway and therefore they are not a factor. Do not worry about them too much but be sure that they do not ruin your reputation in other ways. One good way to keep these people out is to have a dress code. Undesirables of any sore often have a propensity to not dress properly when they go to any sort of establishment so keep this in mind when you are setting rules up.